Pritchardia are single trunked palm trees with fan-shaped leaves. 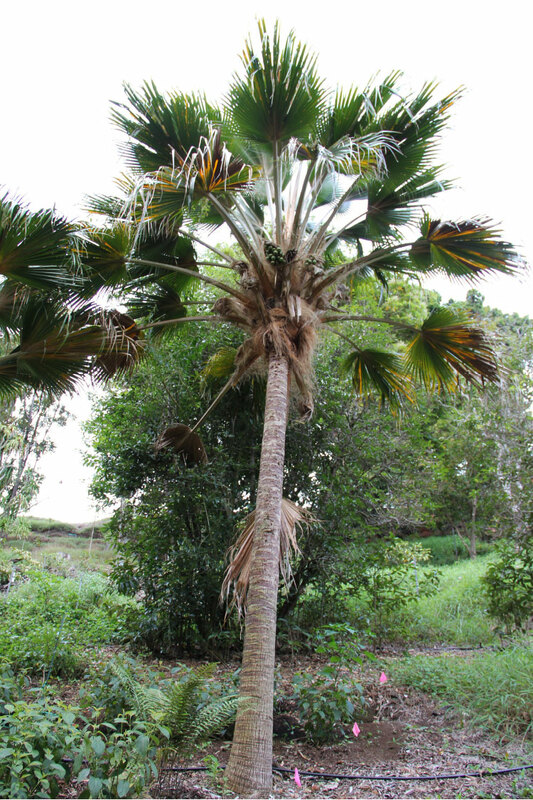 The Hawaiian Pritchardia are generally medium to large sized palms growing from 25 to 60 feet tall. The color and hairiness of the leaves, the length of the flowering stems, and the size and color of the fruit vary by species. For example, Pritchardia martii from O’ahu reaches about 30 feet in height and has leaves that are silvery underneath. The flower stalks grow past the ends of the leaves and the oval fruit is about 2 inches long. On the other hand, Pritchardia hillebrandii is from Moloka’i and grows to about 20 feet tall. It has leaves that are silvery underneath, flower stalks that don’t extend beyond the leaves, and round fruit that is up to 1 inch in diameter and blue to black when ripe.